ShakaNet, the largest provider of wireless Internet services in Hawaii, today announced that it is partnering with FreeFi Networks Inc. to provide free wireless Internet access to passengers throughout the concourses, lounges and concession areas of Honolulu International Airport (HNL). “This is the first deployment of free wireless services at Honolulu International Airport, the largest airport in the state of Hawaii,” said Nam Vu, Chief Technology Officer for ShakaNet. ShakaNet provides Internet service at the airports throughout the islands of Hawaii as well as many of the state’s premier hotels. Vu said that the new free Wi-Fi access will be a boon to many of the state’s commuters and business travelers who use the airport daily, in addition to the large influx of travelers coming to Hawaii during the holiday season. Over the next few weeks the ShakaNet/FreeFi partnership will announce many more locations where the ShakaNet Wi-Fi service will be available for free. “We are very excited to work with the FreeFi team leveraging their experience in providing free WiFi with our long-term commitment to proving quality service. Our goal is to deliver a free quality Internet experience to business and leisure travelers while generating revenue for the venue,” Vu said. 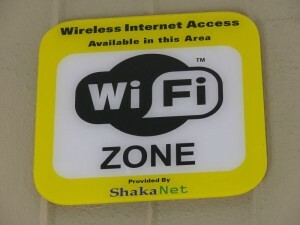 ShakaNet is the largest Wireless Internet Service Provider (WISP) in Hawaii. Founded in 2002 and based in Honolulu, ShakaNet provides public Internet access solutions via Wi-Fi Hotspots, and custom locally-built Automated Internet Kiosks at more than 60 locations on four islands. ShakaNet also provides a full range of cost-effective Internet solutions for hotels, offices, apartments, condominiums and airports using wireless, traditional wired, and Automated Internet Kiosk solutions. FreeFi Networks is a premier provider of content and advertiser-supported Wi-Fi networks in major transportation venues such as airports, trains, and buses. FreeFi is recognized for attracting national and regional advertisers including Charles Schwab, Zinio, FedEx, Ford Motor Company, Holiday Inn, MasterCard, Microsoft, Nokia, Sprint, Toshiba and Verizon, among others. FreeFi Networks also has partnered with Disney-ABC Domestic Television to provide popular video on demand rentals from the Walt Disney Studios. FreeFi Networks is headquartered in Los Angeles with offices in New York City and Boulder, CO. I don’t call that free! This is a LIE – NO FREE WIFI AT HNL. $6.95 for 2 hours is CRIMINAL. Wait and see HNL will probably start charging you just for entering the airport. Still a lie as of 6/27/11. Article is incorrect. Wifi is a paid service as stated in previous comments. Yep, this is a very inaccurate article. Everytime you try to use the wifi anywhere in HNL or Hilo for that matter, it’s pay, pay, pay…. no free wifi in Honolulu International Airport. Having read the story in 2010 about Wi-Fi being free at the Honolulu airport, I was very disappointed to find that this was not so. A call to the ShakaNet customer service number was not veery satisfying. They just said it was not free and they had never heard of it being so. This is completely false as of January 11th, 2012. Not only is the wifi outrageously expensive, but it is also the slowest Internet I’ve used since about 1999. I begrudgingly coughed up the 7 dollars for 2 hours of Internet use, planning on downloading a regular definition movie from iTunes to watch on my flight. iTunes then showed that it would take 1336 minutes to download 1.6 gb. I want my money back! Do not plan to use Internet at HNL! There is nothing free in Hawaii! It’s BS and ifbthe have it’s hidden! Please note FreeFi provide free wifi “for a promotional period” at Honolulu, which is now over. FreeFi is free 100% of the time at other airports they serve, but in Hawaii Shakanet runs this network – and they charge. Too bad. Let’s bring FreeFi back to Hawaii PERMANENTLY! There *is* free wifi in the Dewar’s Clubhouse Bar & Grille (towards the back of the establishment). It is labelled as “ATT WiFi”. All it requires is a checkmark for “acknowledging terms and conditions”. It is *only* in this one patch of real-estate upstairs, though.